Just bought your book from Amazon and a RooStick. While I’m waiting for the book to arrive I tried to get roombaview working with the RooStick. Sometimes I don’t get the java.lang.NullPointerException error but it still doesn’t seem to work. The roostick looks like it’s working. One LED comes on when you plug it into the Roomba and the other comes on when you plug in the USB cable. The CP2103 USB to UART Bridge Controller shows up as COM4 on the device manager. I’m running Windows XP. mode:full or safe depending on which button is pressed. But, are you sure that COM4 the serial port of the RooStick? 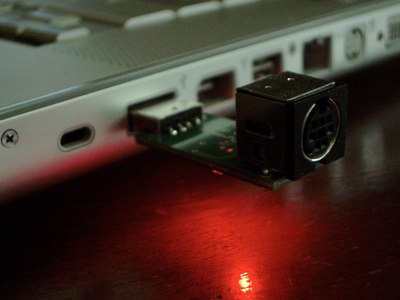 In my experience, USB-to-serial devices on Windows have a much higher COM port number, like COM10 or similar. You can find out what COM port it is by going into Device Manager. The Arduino setup guide for Windows has a pretty good explanation of how to install and deal with USB-to-serial adapters. Make sure you’ve installed the latest driver for the RooStick. It works! The RooStick showed up on COM4 in the Device Manager and I’m using their cable. It turned out to be the port baud rate. It was set for 115,200. I changed it to 57,600 and it worked. I’m sure that’s obvious to most hackers or it’s in the instructions somewhere. However, in my haste to just make it work, I never considered it. My clue was the SCI specifications section about lowering the rate from 57,600 to 19,200. Now I need to get Bluetooth. This short cable is a real problem. Thanks for the great web site. Your book arrives on Monday. I’ve just bought a roostick, and it works well on my PC, but not on my laptop(or my friends’), it will be an “unrecognizable device” (I use Chinese Windows XP, so I’m not sure what it is in Engish). I’ve installed the drivers from irobot and VCP drivers in the article, but still can’t work. I wonder if you’ve had this question and I really need some advices. Thanks very much. That’s very weird, I’ve never heard of such a problem, but it does sound like the drivers aren’t getting installed somehow on the laptop. The USB chip in the RooStick is pretty standard, and the drivers needed for it are just the ones needed in the RooStick documentation (CP2103 drivers). One thing to try: go into the Hardware Device Manager and look at the list of devices, see if there are any with a red ‘X’ or a yellow ‘?’. That might give you some hints. I’m not very experienced with Windows, unfortunately. I’m using Linux and everything seems to run okay with the RooStick, when I plug it in /dev automatically appears the /dev/ttyUSB0 port. What is weird for me is that the roombacomm.listPorts() command returns an empty list. I don’t know if I’m missing something referring to how Linux ports work. Any idea will be very welcome and thanks in advance! over the RXTX files in the ‘rxtxlib’ directory. Thanks for your help. The out of date library thing made sense for me. I just did exactly what you said, but nothing happened and the message is still the same. Anyway, thank you for your clear and detailed instructions. Don’t you know any Linux specific forum on that issue or something like that? I’m afraid I have the constrain of using it with that OS. What distro and version of Linux are you running? On some version (I think I had this problem on a version of Ubuntu), the Braille package “brltty” conflicted with USB serial ports & RXTX. The solution was to remove it (I don’t need Braille support) with the command “sudo apt-get remove brltty”. Well, I still haven’t tried to use the RooStick with roomba, but at least with Ubuntu I can read from ports. So, I guess that everything will be okay with the roomba. I have to say that I’m very impressed about your quick answers. Usually, posting on forums one has to wait for long time to receive an answer. So, thank you very much for your quick help Tod! You can use a 8 mini din cable if it is wired straight through. They say right in the description… a mac serial cable will NOT work. There you have it! I don’t know how useful this is anymore, but the iRobot Create USB cable – http://store.irobot.com/product/index.jsp?productId=2818673 – works great with RoombaCommTest and my Roomba Discovery. It’s only $20 + shipping; the cheapest option unless you want to build your own. Also, iRobot does still sell the OSMO//hacker modules, but they aren’t linked to on the site. These can enable the SCI on older Roombas. Each product page tells how to identify which version you’ll need, though hacker 2 is for earlier Roombas than hacker 1. Also, if your Roomba was manufactured on/after October 24, 2005 it should already be SCI capable. Sorry, but I should have noted that I’m using the USB cable with a Windows 7 PC. Me too, have the same problem, somehow Can’t connect in Windows 7 to USB cable to Roomba. Any suggestions? Even simple terminal program can’t connect.